We are able to manufacture and export a wide range of Material Handling Equipment, Conveyors and Material Handling Systems. 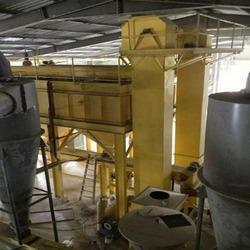 The use of latest technology and optimum quality raw materials ensure for compact design and smooth operation. These are ideal to be used for handling free flowing material such as rice, wheat, malt corn, and sunflower seed and even saw dust. These are available in the markets at the optimum cost. 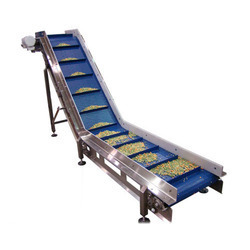 In the field of manufacturing and trading, our company offers supreme quality Flat Belt Conveyors. The skim coating on the plies are of a highly resilient rubber compound, which minimizes the possibility of ply separation and improves impact resistance to cope with all mechanical and thermal requirements. The top and bottom covers provide protection to the carcass. Cover quality is always selected according to the material to be conveyed and the service conditions. Rubber belts, P.V.C belts, Polyurethane belts and plastic modular belts with or without side flaps (glued or ultrasonically welded as per requirement/application). With aluminium extrusion frame or standard mild steel/ stainless steel tubes. Open type or covered type, (using transparent plastic cover or sheet metal cover). Plastic or stainless steel side walls. 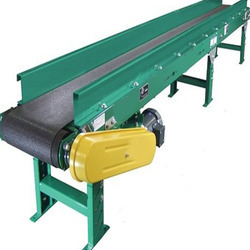 We are a known name as the manufacturers and traders of a wide range of Cleated Belt Conveyor in the market at present. We adhere to the industry protocols to provide with the variegated customer specific needs. The carcass consists of wholly synthetic fabrics covering both Nylon/Nylon (NN) and Polyester / Nylon (EP). Breaker ply can be laid over the top and bottom fabric plies as per the customer requirements, in case any additional protection is required to the carcass. This is recommended for severe service conditions thus providing a better bonding between the cover and carcass & to withstand impact forces during service. 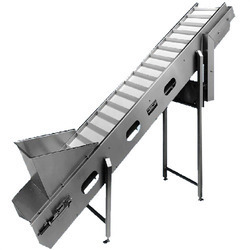 Our company has mastered the art in offering Modular Belt Conveyors or Elevators to the clients. These products are manufactured by professionals utilizing high grade raw material under the guidance of experienced professionals in compliance with industry standards. Modular Belt Conveyors/ Elevators are thoroughly checked under various quality assured parameters to ensure functionality and robustness. Offered range is used for loading and unloading of bins, bags, pouches, pockets, packed material, utensils, pressed components, food products and carton boxes. 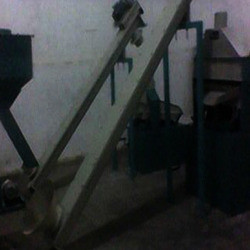 Our company has been dedicatedly manufacturing and trading Screw Conveyors in the market at present. These come with a well-tested design, easy servicing and reliable performance which makes it a product with an optimal pay-off. This one consists of two or more pulleys (sometimes referred to as drums), with an endless loop of carrying medium—the conveyor belt—that rotates about them. One or both of the pulleys are powered, moving the belt and the material on the belt forward. The powered pulley is called the drive pulley while the unpowered pulley is called the idler pulley. As a leading manufacturer and trader of Bucket Elevator, we have been recognized as a trusted name in the market at present scenario. It comes with finest of the raw materials along with upgraded tools and technique involved in the construction of the belt. It has high strength, superior resistance to abrasion, cut and gouging, used for transporting abrasive material. It has been specifically designed in order to carry off material that have got higher degrees of temperature. It is heat resistant and can transport coarse materials with ease. These are made available to the customer at industry leading rates.